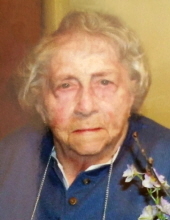 (Anna) Gale VanLoon, age 96, of Vernon passed away peacefully on Sunday, Jan. 27th, 2019. Funeral Services will be held 11:30am Saturday, February 2, 2019 at Nelson-House Funeral Home with Reverend Norman Beckwith officiating. Burial will take place at Greenwood Cemetery in Vernon. The family will receive friends at the funeral home on Friday, February 1, 2019 from 4pm to 8pm. Gale was born in November of 1922 in Wheeler, Michigan; the daughter of Leslie and Mary Ackley. She graduated from Durand High School; Class of 1941 and went on to study at Lansing Business College before being employed at Redmond's of Owosso during WWII. She married Thelbert (Tim) VanLoon in 1947 and resided her entire life in Vernon. She was a member of the Vernon United Methodist Church. In earlier years she assisted with Girl Scouts Troops in Vernon. She enjoyed gardening and going to flea markets. Gale is survived by her daughters Linda VanLoon of Vernon and Mary VanLoon of Chesaning, along with several cousins and many nieces and nephews of whom she was very fond and also the family of Martin and Jennette Maier of Chesaning and James and Christine Keyes of Durand. Also special neighbors Don and Kate Hamilton, Russ and Connie Hilliker, and John (and the late Betty) Rosser. Special thanks to Pat Dennison, caregiver, from the Shiawassee Council on Aging for several years of devotion and care. She was predeceased by her husband in 1983; brothers Lewis and Carl Ackley and their wives of Vernon; sister Janet Mau and husband of Owosso; several brothers and sisters-in-law; nieces Margy McCaslin, Diane Beagle, Karen Greshem and nephew Curtis Mau. Those wishing to share an expression of sympathy might consider the Shiawassee Council on Aging, Vernon United Methodist Church, or the Vernon Public Library. To send flowers or a remembrance gift to the family of Anna Gale VanLoon, please visit our Tribute Store. "Email Address" would like to share the life celebration of Anna Gale VanLoon. Click on the "link" to go to share a favorite memory or leave a condolence message for the family.